This is an art attack. Those words have haunted me since I was seven. Every weekend I would mither my dad to go to Staples and bring me back some water colours, rolls of printing paper and, vital to every budding artist, some PVA glue. And I would always fail miserably in making anything that.. that…. that man featured on his show. I’m sorry Mr Buchanan, but it is scientifically impossible to create a Barbie Dream House using a plastic milk carton and a few egg cups and PVA GLUE. I think my love, obsession, passion- whatever you want to call it- for illustrated books came when I realised that I’m absolutely terrible at drawing. You do not want to be on my team at Pictionary. So after spending about 3 years of my life being covered in glitter, sugar paper and pretending the pencil shavings in my hair were intentional, I realised it would be easier and safer (Mum was not impressed with Play-Doh in the carpet) to just look at pictures in books. But, living in Britain, it wasn’t as if I was going to be short of beautifully illustrated books, was I? 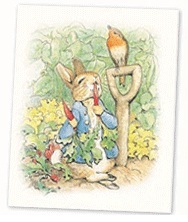 My favourite type of illustrator are the ones who have become synonymous with the books that they illustrate..
Can you imagine a Beatrix Potter book without illustrations as beautiful as this? I’m so desperate to go to Hill Top Farm in the Lake District (which isn’t even far from my house!) but I don’t have much luck with visiting literary places. My trip to Wuthering Heights ended up in a near-flash flood and my sister nearly got eaten by a disgruntled cat on our trip to Sylvia Plath’s grave. 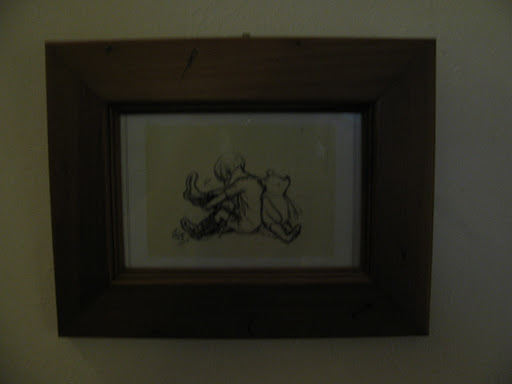 And what about these stunning pastel pictures produced by E.H Shepard for A.A Milne’s masterpiece? I probably don’t need to talk about Quentin Blake and how much I love his illustrations. I always find myself wandering through card shops, grabbing handfuls of his cards and buying them all. Well that’s nice, I hear you say. Your friends will love them. No no. Not for them. I once saw a version of Charlie and the Chocolate Factory with Johnny Depp and Freddie Highmore on the front and I nearly wept in the book shop. I’m not really a big fan of film tie-in book covers… but there must be some law against that one, no? 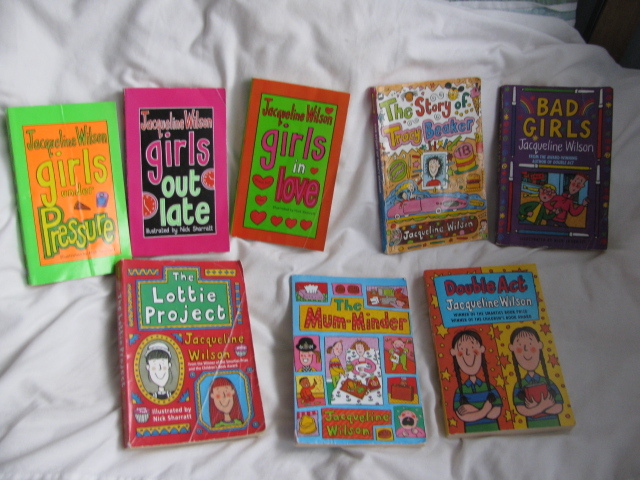 But how about Jacqueline Wilson’s books without Nick Sharratt’s fantastic illustrations? What I love most about Mr Sharratt’s illustrations are how colourful they are. You can tell that he had so much fun drawing them and they capture the. From Tracey’s cheekiness to, Ms Wilson’s character’s leap off the page with the aid of the pictures and it’s no wonder that Ms Wilson’s books are the second most borrowed books from Britain’s libraries (behind Ms Rowling). Even though the illustrations on the inside are black and white. And, I’ll tell you a secret, on my first copy (I’ve gotten through about three!) 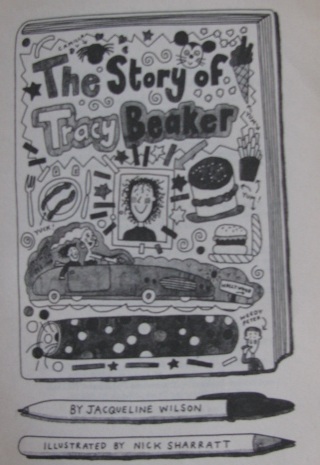 of The Story of Tracey Beaker I actually grabbed my pencil crayons and coloured them in. I know that book readers will be grasping their pearls at the mere thought of colouring a book in… but don’t blame me, blame Mr Sharratt! 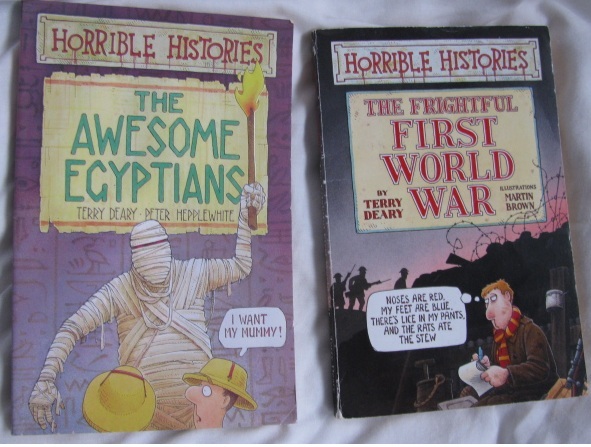 I’m willing to bet that every child in Britain has read at least one of the Horrible Histories books, or if not read them they will have heard of them and therefore be itching for the birthday/Christmas fairy to bring them one. These books have been a firm favourite of mine and I always, much to my parents distress, brought at least two home from every school fair/ Blue Peter Bring and Buy sale. A couple of years ago I gave most of them away to charity, but I kept my two favourites. Like Mr Sharrat’s, Martin Brown’s (who is actually Australian but he lives in Dorset, so he still counts) illustrations adopt a more cartoon-esque stance as opposed to more realistic drawings. Either way, they’re a visual treat and they’re informative and they’re funny and they’re horrible. Another of my favourite things about these illustrators are their personal websites. I know nothing beats seeing these drawings on a page in context but, mate, these websites are the best. I could spend hours on all of them. Beatrix Potter || Packed full of fascinating information Ms Potter’s life and career, combined with her beautiful illustrations (Lovely winter ones to get you in the Christmas spirit!) and photographs of the Lake District which inspired many of her stories. Also, it’s packed full of pictures of her early sketches, a chance to ask questions about her, resources for teachers and parents, recipes, a shop to buy Beatrix Potter merchandise and even a downloadable advent calendar for your computer which is just gorgeous! Hurry up December! Quentin Blake || Information about his foreign events, how Mr Blake got into illustrating, his friendship with Dahl himself, advice on young illustrators, information on how to use Blake’s illustrations in classrooms and libraries and even at home. Also, some brilliant information on his Dahl-free books and a chance to buy his merchandise! Nick Sharratt || I love this website. Brimming with bright colours, great interviews and a chance to see what other books Mr S has illustrated and a brilliant page that provides an insight on what a real illustrator’s studio looks like! Also, if you’re interested in learning more about children’s illustrators, please have a read through the Guardians series on Children’s Illustrators. AND, saving the best until the last, the wonderful Amy (from Turn the Page) has fast become one of my favourite British illustrators… just look at them! I have no doubt that her stunning creations will be gracing the books on the bookshelves in years to come and I’ll be the first in line to buy them all! There is so much talent… I wish I could do an illustrated book year! Oh man I loved Art Attack pva glue for miles! The one where he makes that cartoon cat was always my favourite but I could never do anything either. Rebecca Dautremer is my favourite illustrator – all french children's picture books are like pieces of art. Just stunning. Im looking forward to your posts this week! I did not know Amy from turn the page was a book illustrator! Her work is beautiful! « Illustrated Book Week: Introduction.